That’s right! It is the most wonderful time of the year as the NHL started last night. Ryan Pike of The Hockey Writers was kind enough to sit down and take his turn on the hot seat. We have a dozen questions and Mr. Pike answered them all. Let’s see what we got here! 1. What was the one thing that surprised you about Calgary last season? Probably the level of buy-in across the entire season. They didn’t have many stretches of bad or lazy hockey, and they only lost one-sided laughers four times. That’s pretty good for a team that finished where they did. 2. Everyone talks about the brawl. Was it really a season changer or was it just a matter of players returning? I think the brawl really galvanized the team, in the sense that it cemented their “us against the world” mentality. They went into a tough building for them to win in, lost four bodies off their line-up on the opening face-off, and still got a point. 3. Why is the rebuild seemingly ahead of schedule for the Flames? The work ethic that’s been drilled into these guys by Bob Hartley. They aren’t allowed to take a shift off. 4. Will anyone fess up to the Boring Sean Monahan account on Twitter? Why is it so popular? So far nobody has fessed up to it. My working theory is it’s Brian McGrattan. 5. What difference will Jonas Hiller make in net for the team? Probably a big one. 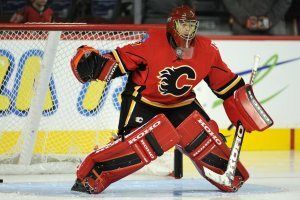 He’s a lot better than Reto Berra, Calgary’s previous Swiss netminder, and his skill level will really push Calgary’s other netminder, Karri Ramo, to continue to work hard and improve. Goaltending might be Calgary’s strength this season. 6. Who is the one player that has shown the most improvement from last year until this year? I’ve really liked Kris Russell, and he really came into his own during this pre-season. He’s been named an alternate captain and he’ll be relied upon heavily to provide more offense from the back end of the line-up. He’s still not huge, but he’s very talented. 7. There are quite a few people who have picked the Calgary Flames to slide back a bit. Can you see why or are they a little off base? Mike Cammalleri was huge for Calgary’s offense. With him and other players gone, there goes about 20% of their scoring. Unless Johnny Gaudreau is the real deal or Sean Monahan can improve on a strong 22-goal rookie campaign, the Flames will struggle to score and lose a lot of 2-1 and 3-2 games. 8. Which is the one team that concerns you most in the division? There’s so many good teams in the Pacific. Let’s go with the reigning champs, the Los Angeles Kings. 9. How does the team shape up coming out of training camp? Will they get off to a good start? It’s a veteran bunch. The only rookie on the team is Johnny Gaudreau, which should help with managing jitters and consistency. On the other hand, the club has just one great defensive pairing in T.J. Brodie and Mark Giordano and lacks any high-end offensive threats. And they start off the year with a six-game road trip that goes through cities like St. Louis, Chicago, Nashville and Columbus. It could be a long trip. 10. Who are some prospects we should be keeping an eye out for in 2014-15? Markus Granlund was strong last season and played in every situation during his call-up. Tyler Wotherspoon was also quite effective last year, albeit playing with a pretty banged-up shoulder. I also wouldn’t be shocked if guys like Sven Baertschi, Max Reinhart or Josh Jooris got cups of coffee in the bigs this year. 11. What is the biggest change from last season to this season about the Calgary Flames? Better goaltending, but a lot less scoring. And probably fewer wins as a result. 12. Where do you have Calgary finishing in the Pacific? Could they even make the playoffs? They’ll be either sixth or seventh in the division. There’s a chance that either Edmonton or Arizona could fall underneath them. Chances for the playoffs are extremely low. Up next will be the Edmonton Oilers. That one is guaranteed to be a lesson of lessons.